During the Olympic Games in Rio I heard several athletes use the phrase “it was not my day” or “today’s not my day” in their post-competition interviews. Are you familiar with the phrase? You can say this when you’re having a bad day or many things are going wrong. For example, you missed your bus, you’re late for work. You forgot your lunch and lost your wallet. What a day! 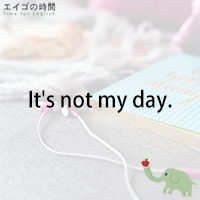 You sigh and say “It’s not my day”. You got a flat tire in the morning. Your phone broke in the afternoon. At the end of the day your boyfriend disappeared leaving a note saying “I need my space”. All happened on the same day! It was just not your day. Now would you like to try a quiz to make sure you get the phrase right? You’ll be given three options. Please listen carefully and choose the one that is TRUE. Ready? Next Post 別れてくれ。 – I need my space.